Here is Bill “Smitty” Smith, drummer in the band Truth & Salvage Co., rocking out in a Canadian Tuxedo (Gap jacket and Levi’s jeans) at The Spare Room in the Hollywood Roosevelt Hotel. Truth & Salvage can be seen at the Troubadour on March 24 at their farewell show before they relocate the band to Nashville. With indie denim powerhouse Imogene + Willie putting out some of the best double denim looks, we think Smitty will feel right at home. 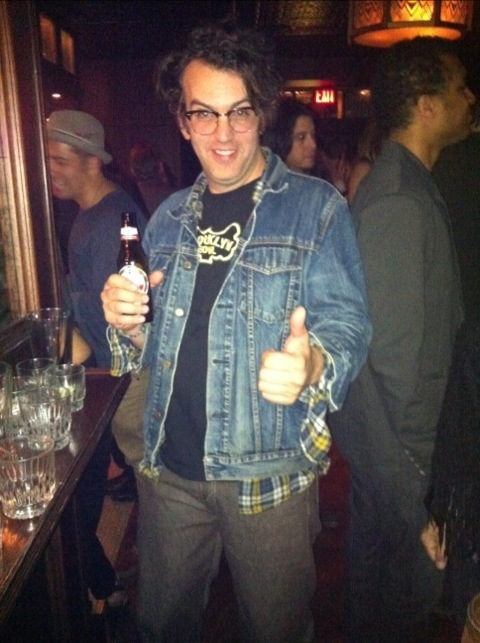 This entry was posted on Friday, February 24th, 2012 at 2:13 pm	and tagged with Bill "Smitty" Smith, Canadian Tuxedo, Denim, Fashion, gap, Hollywood, Hollywood Roosevelt Hotel, Imogene + Willie, Levi's, Los Angeles, The Spare Room, Truth & Salvage Co. and posted in In The Wild, Music. You can follow any responses to this entry through the RSS 2.0 feed.